Program Energy Diary is written in Java from Sun. and it is platform and OS independent. That means Java Runtime Enviroment is interface between operation system and Java program. Theoretically it is possible to run program on all platforms where is possible to download Java Runtime Enviroment. Program is tested on Windows XP and it run without problems. For other platforms it is recommended to download trial version of program and try it. When trial version will run, complete version will run OK too. If you will have problems with program send me error on my e-mail and I will try to correct the problem. After installing correct Java Runtime Enviroment you can install Energy Diary program. When you download program, you will download instalation program diary.exe. Installation create files diary.jar, diary.bat, diary.ico and setup.exe. Energy Diary you can execute by double-clicking on desktop icon, or with diary.bat. 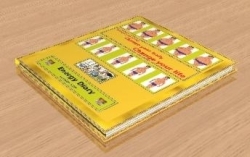 First execution of program, prepare all necessary databases for using of Energy Diary program. When you download program, you will download file diary.jar. Program you can execute with command java -jar diary.jar. The best solution is create command file where you write command above, for example diary.cmd. First execution of program prepare all necessary databases for using of Energy Diary program.